"It is easier to be wearing hijab in London than Cairo." This is how 47-year-old Dalia Anan describes her experience as a woman wearing the Islamic headscarf - also known as hijab - in London compared to her hometown in Egypt. Dalia, an engineer who works in the IT industry, moved to the UK two years ago to be with her children, who are studying in London. "I feel judged in Egypt more than I do here," she says. Egypt, whose population is predominantly Muslim, used to be a welcoming space for women who chose to wear hijab. But for the past few years this has been changing, especially for women from the upper class. "After a certain time in the evening, you are not allowed into some restaurants or what are regarded as 'cool' places, especially in the north coast," Dalia says. The north coast resorts along the Mediterranean Sea are Cairenes' number one destination during summer holidays and will be their go-to place during the Eid festival which marks the end of Ramadan. Dalia says she was denied entry into two high-end restaurants in one of the north coast's top resorts last summer because of her hijab. For Cairo's upper class hijab-wearing women this is all too familiar. Dina Hisham, a 23-year-old Egyptian living in Canada, says: "I never imagined that in Egypt, I would have to enquire in advance about whether a certain place allows women wearing hijab or not." Several women also reported not being allowed to swim with the full-body "burkini" swimsuit or scuba diving suits in some resorts. "The problem is that hijab has become subconsciously categorised as 'low class', and, hence, it is banned in places that cater exclusively for the high class," says Dina, who studies Kinesiology at York University in Toronto. In Egypt, Dina explains, "high class now refers to those who have a lot of money, speak English rather than Arabic and are 'open minded', which means they drink alcohol and wear revealing clothes". Despite repeated requests for a response from the establishments which the interviewees said did not allow the hijab, none were forthcoming. And it is not just about being barred from certain places. 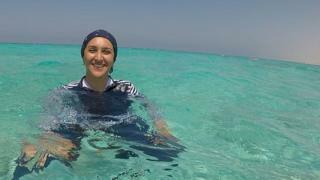 While most Muslim women in Egypt wear the hijab, some are finding it difficult to cope with the growing peer pressure. All those I spoke to said an increasing number of Cairo's upper class are taking off the hijab, and they said those who are still wearing it frequently get questioned about why they still have it on. Egyptian Manal Rostom, a clinical pharmacist and Nike's first hijabi model, calls it "the anti-hijab era". "All my friends and relatives took it off and kept telling me I was the only one left wearing it. "I got provoked, and because I don't want anyone to mess with my mind took the decision to set up 'Surviving Hijab'," says 38-year-old Manal, who is based in Dubai. The Surviving Hijab Facebook group was launched as a closed group in 2014 with the aim of supporting women around the world who are wearing the hijab, thinking about wearing it or even took it off and are struggling because they want to put it on again. The group now has over 620,000 female members, mostly from Egypt. Manal says the group proved successful because "obviously there was a need for such platform". "Women were afraid of speaking up about problems they face in relation to hijab… the group provided them with the opportunity to speak up and lean on each other." Manal says she hopes community reaches the stage where it does not matter whether someone wears the hijab or not. The stigma of wearing hijab among Egypt's upper class was also one of the main drivers for the #MyChoice social media campaign that was launched in May. One of the campaign's co-founders, 30-year-old Heba Mansour, says she had "a cultural shock" when she moved to Egypt three years ago after living abroad with her family. "You are mocked and downgraded because of the hijab," says Heba, who works as a senior progressive adviser at the American University in Cairo and just completed her Masters degree in educational leadership. "Such situations made me feel stronger about the whole campaign," she says. The campaign that runs during the Muslim holy month of Ramadan features the stories of 19 hijab-wearing women under the English hashtag #MyChoice. "Participants represent success stories in different sectors… to send the message that hijab is not an obstacle and to tell other women: Do not let anyone judge you based on how you look," says Heba. "We are doing this campaign for one purpose. To tell other women 'you are not alone'." Video 100 Women 2016: Why wear a hijab? Volleyball in a hijab: Does this picture show a culture clash?